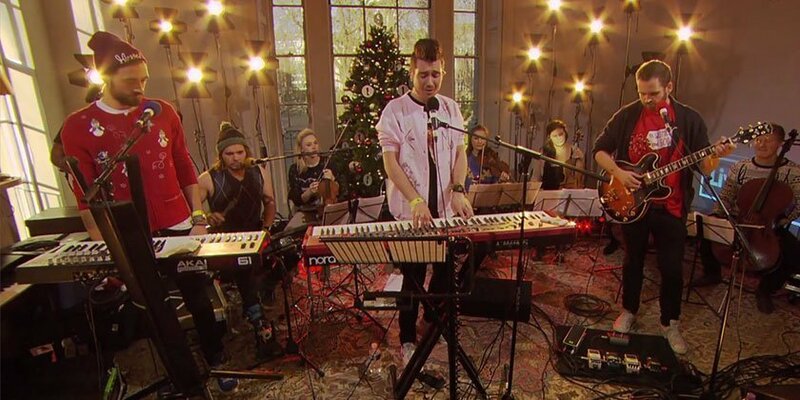 Bastille appeared for a short set on BBC Radio 1's Christmas Live Lounge, performing their hit "Pompeii" and a special Christmas Mashup, premiered exclusively for the set. "Pompeii" was performed with an interesting mix of sampled drums, synthesizer tones, and a live string ensemble. The Christmas Mashup was something more of a technical feat than a hit song. There's no list of the exact number of songs contained in the mashup, but it remains coherent despite changing the lyrics sampled after each phrase. The chorus build-up alone shuffles through "Last Christmas," "Driving Home For Christmas," and "All I Want For Christmas" coherently, despite the strange repetition of the holiday's name. The mashup is the second one released by Bastille, following their song "Of The Night," released in October. "Of The Night" combined nineties classics "Rhythm of the Night" and "Rhythm is a Dancer" in Bastille's own unique style. For more music, news and more, check out Bastille's Zumic Artist Page.